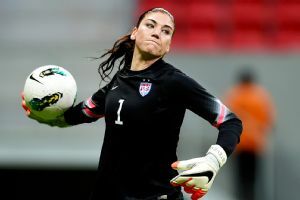 Goalkeeper Hope Solo has been suspended from the U.S. women's national team for 30 days, U.S. Soccer announced Wednesday. U.S. Soccer cited an incident during training camp, which currently is being held in Carson, California, but did not offer further details. A source close to the U.S. women's national team told espnW's Julie Foudy that Solo's suspension was the result of a culmination of things, including her run-in earlier this week with police. Solo was a passenger in a car driven by her husband, former Seattle Seahawks tight end Jerramy Stevens, when he was arrested on suspicion of driving under the influence early Monday morning in Manhattan Beach. Police said Solo was not arrested or detained. U.S. Soccer cited an incident during its current training camp in suspending goalkeeper Hope Solo for 30 days. The source told espnW that team officials were furious they had to find out about the incident from a TMZ report, not directly from her, and that it happened during camp. The suspension is effective immediately, with Solo being released from camp. She also will miss matches Feb. 8 in France and Feb. 13 in England. "During our current National Team camp, Hope made a poor decision that has resulted in a negative impact on U.S. Soccer and her teammates," coach Jill Ellis said in a statement. "We feel at this time it is best for her to step away from the team." Solo addressed the suspension on Twitter, writing, "I accept and respect the Federation's decision." "I apologize for disappointing my teammates, coaches and the Federation who have always supported me," she wrote. "I think it's best for me to take a break, decompress from the stress of the last several months, and come back mentally and physically ready to positively contribute to the team." U.S. Soccer said Solo, 33, will be eligible for reinstatement after 30 days, if approved by Ellis and the governing body. There are stipulations for her return, the source told espnW, declining to elaborate on specifics of the stipulations. The team is preparing for the World Cup, which starts in June. It is the latest off-field trouble for Solo, who holds the team record for shutouts and has won two Olympic gold medals with the U.S. team. Solo had domestic violence assault charges against her dismissed earlier this month. She was facing two misdemeanor counts stemming from an altercation with her half-sister and 17-year-old nephew at a party in June in Washington. Solo had pleaded not guilty in that case, and she continued to play for the U.S. team and with her National Women's Soccer League team, the Seattle Reign, while awaiting trial. Her last appearance with the national team was in December, when she started in a scoreless draw against Brazil in the championship game of the 2014 International Tournament of Brasilia. In September in an exhibition victory over Mexico, Solo logged her 72nd shutout, passing Briana Scurry (1994-2008) on the national team's career list. The suspension comes at a critical time for the U.S. team. Following the exhibition matches in February, the U.S. team will play in the Algarve Cup in March. The team will open World Cup play June 8 against Australia in Winnipeg, Manitoba. An expanded field of 24 teams will compete in the World Cup, which will be played in six Canadian cities. The United States is in Group D, which also includes Sweden and Nigeria. The U.S. women, currently ranked No. 2 in the world behind Germany, are seeking their third World Cup title but first since 1999.